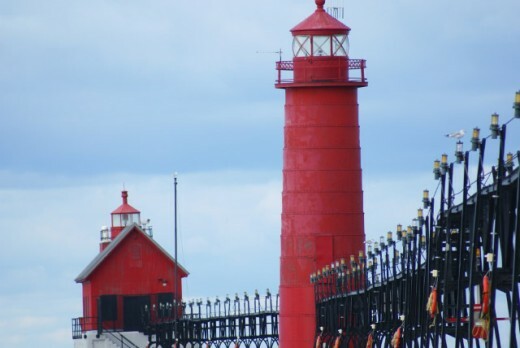 Big Red lighthouse is a very unique lighthouse. 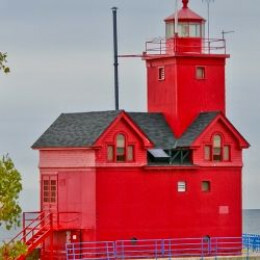 It is set apart from other lighthouses by it's bright "fire engine" red color and it's distinctive Dutch archictecture. 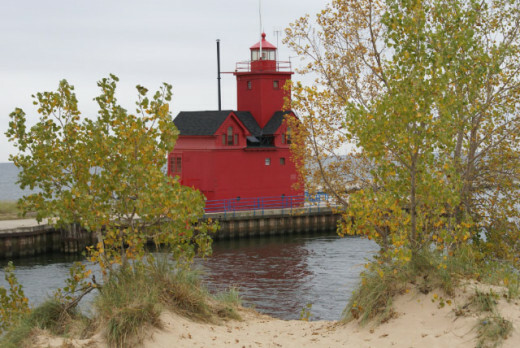 I was delighted to see this unusual lighthouse on my visit to Holland, Michigan. 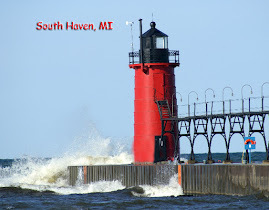 On this page I will showcase some of the photographs I took of "Big Red" and provide information to some of the attractions available in Holland, Michigan. I was able to photograph Big Red in October when the leaves were beginning to turn colors. 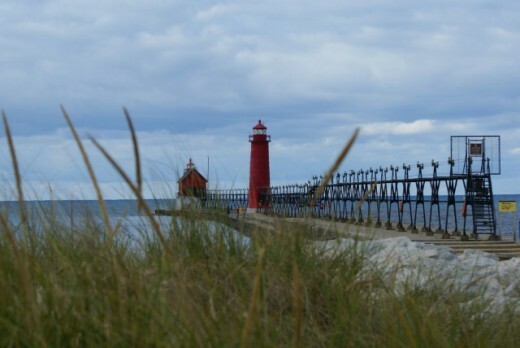 This photo was taken from the sand dunes in Holland Park across from the lighthouse. Our visit to the lighthouse was the culmination of a great visit to a very interesting town. 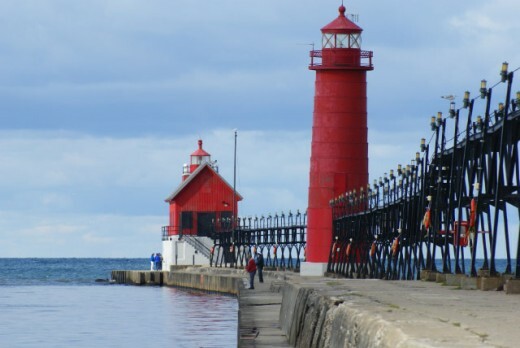 Holland, Michigan has a lot to offer the visitor. Although we visited in the fall, I am told it has a great tulip festival each May with over 6 million tulips in bloom. The town also boasts a 240 foot windmill that was brought from the Netherlands. It can be seen on Windmill Isand. There is a Dutch Village Theme Park that has lots of great shops with products from the Netherlands. We were able to watch wooden shoes being made and even to try on some of the finished product. It was great fun to try to walk in wooden shoes! There was some wonderful pottery from the only Delft factory outside of Holland. I had visited the factory in Delft, Holland so I was curious to see what the American factory was like. Although much smaller, it did have many of the same pieces. 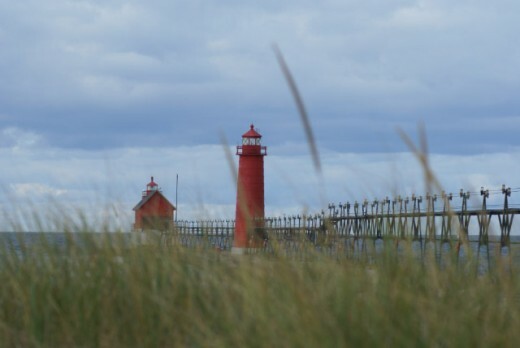 The first lighthouse in Holland was constructed in 1872. 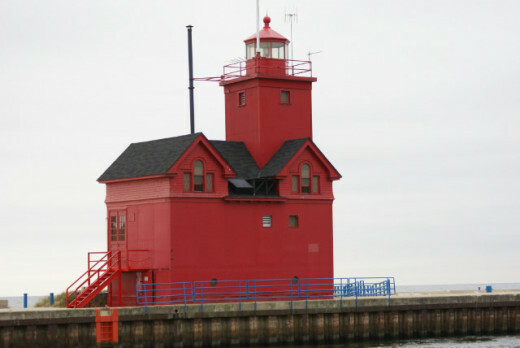 The current lighthouse, shown in this photo, was errected in 1934. It is covered with metal plates to protect it from the weather and waves. 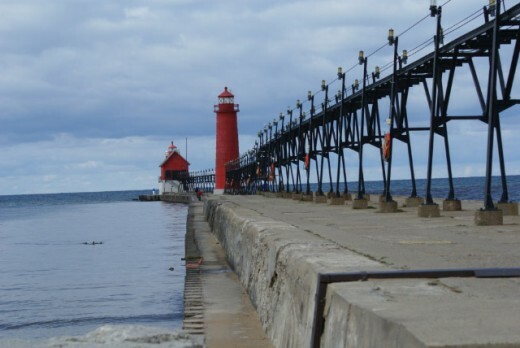 This photo was taken from the edge of the pier in the park across from the lighthouse. 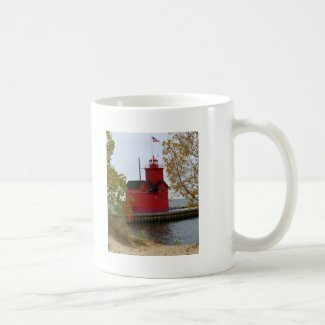 Here are some Zazzle gifts made from my photographs. I love to be able to see a lighthouse up close. 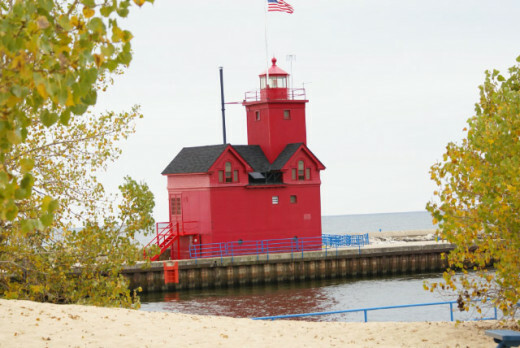 The lights at Grand Haven provide this opportunity! I was delighted to find two lights connected to the beach by a long stone pier and a raised catwalk to connect the two lights. My friends and I took the opportunity to walk out on the catwalk and see the lighthouses up close It was a chlly fall day on Lake Michigan, but the slight discomfort was well worth the pleasure of photographing the lighthouses from a variety of angles. This photo was taken when we first arrived at the lighthouse. It was taken from the beach area as we approached the lighthouse. There are several small sand dunes near the pier where this photo was taken. I walked around the area to find the best view of the lights with the sand dunes and grasses in the foreground. 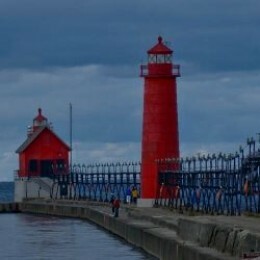 The Grand Haven Lights consist of two lights and an elevated catwalk that connects the two. 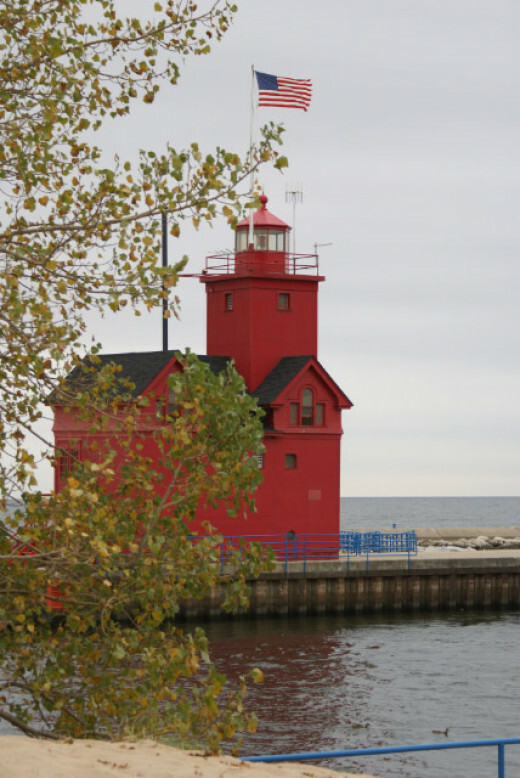 The south pierhead light is a red conical steel plate tower that was constructed in 1905. The inner lighthouse is barn shaped and was originally built in 1875. It was moved to the end of the breakwater in 1905. 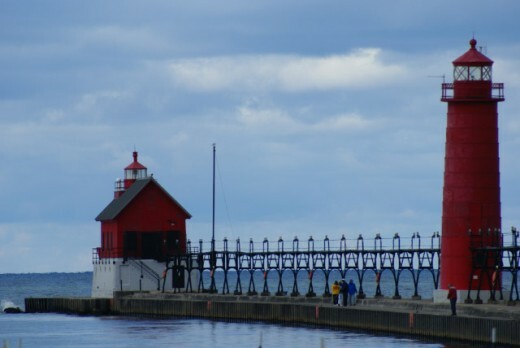 The two lights stand several hundred feet apart on the long pier. 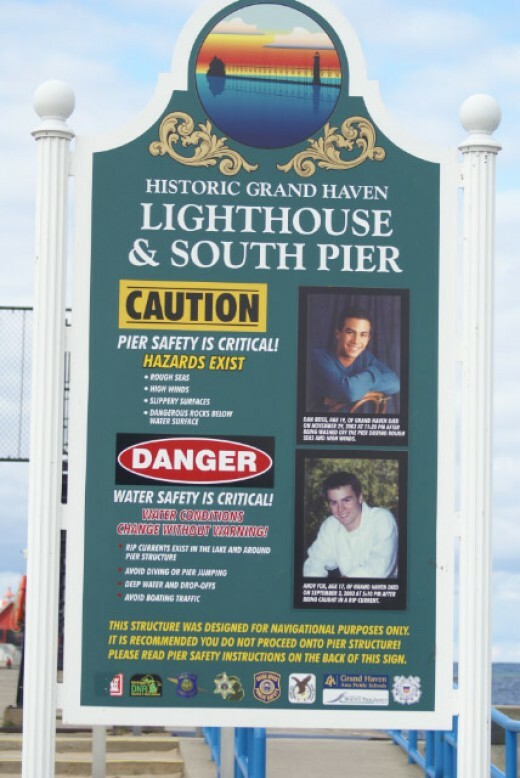 This marker is seen just as you enter the Pier. 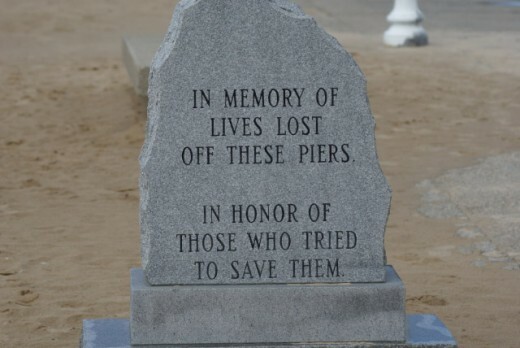 It honors those who lost their lives off this pier. Warnings are posted at the entrance to the Pier. The weather can get quite rough on Lake Michigan, particularly in the winter so it is important to heed the warnings. 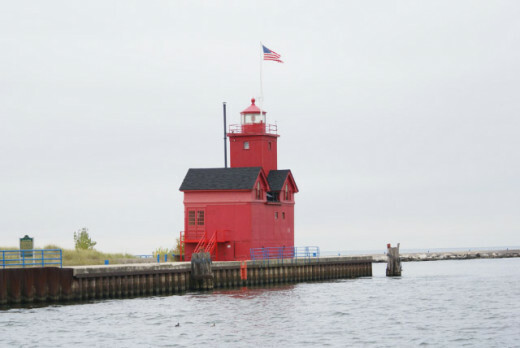 Like many of the lighthouses on Lake Michigan, the Grand Haven lights are maintained by the Coast Guard. My friends and I enjoyed a wonderful walk out on the pier. It was great to see the lighthouses up close. 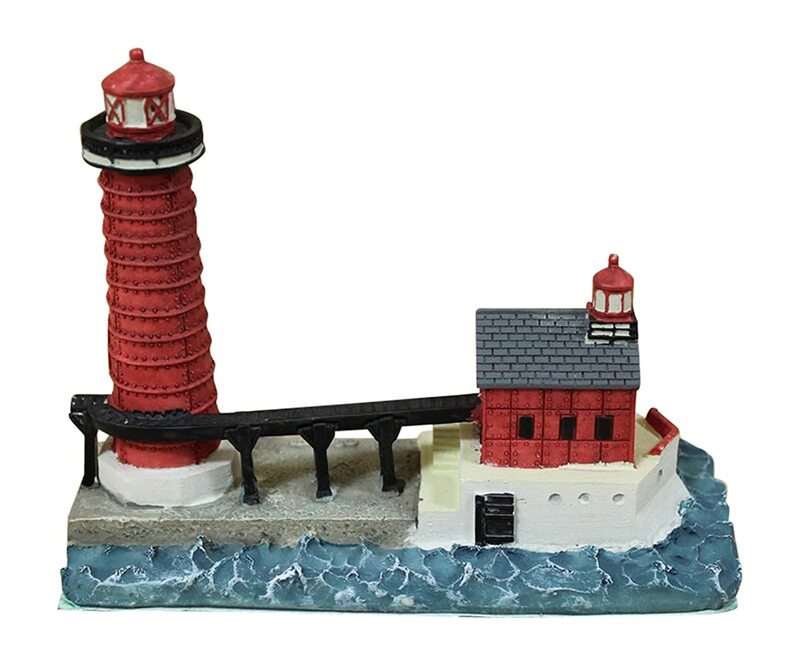 Here is a great little replica of the lights at Grand Haven.